I am not yet 18 years old, am I eligible to apply? You must be enrolled in an undergraduate institution at the time of application, and you must be 18 before the internship program starts. I’ve already graduated, am I still eligible? Yes, if you graduated within the last year you are still eligible. If you graduated longer than a year ago you may still apply, however your priority will probably be lower. I’m not a U.S. citizen, am I still eligible? Only U.S. citizens and permanent residents are eligible for Akamai. I’ve already done Akamai, can I apply again? Yes. Akamai alumni are encouraged to apply for a second internship, and in some cases alumni may want to try a different site or type of project. Selection priority given to alumni applicants varies, and at times a higher priority may be given to a new applicant. I’ve had a few low grades, am I eligible? There is not a minimum GPA for Akamai, and poor grades do not necessarily disqualify applicants. Selection committee members review transcripts and look at trends. For example, steadily improving grades are looked upon favorably. Also, the committee understands that students may have life circumstances that result in lower grades for a semester or year. It is important for applicants to provide an explanation for poor grades, so that committee members can consider reasons for deficient performance in light of the entire application. It is also important to note that Akamai considers many factors when selecting applicants, and is seeking hard-working, motivated interns – that is, those that really want it, and do what it takes to get the job done. Grades are not necessarily indicators of these qualities, so Akamai gives strong consideration to applicants with a wide range of GPAs. I don’t have a lot of job skills. Do I have a chance of getting selected? Akamai works closely with mentors to outline intern projects and the skills needed to complete the project, and then during the selection process the committee matches applicants to projects, carefully considering the applicants skill set. Akamai program staff work intently each winter to identify a wide range of projects, so that applicants from a broad range of majors and levels can be placed with projects. Mentors expect that interns will need to learn many new skills during the internship, and don’t anticipate interns to arrive fully trained. However, in some cases, interns may need proficiency with one or more skills to have a productive internship, so some experience may be necessary. IMPORTANT NOTE: The application includes a section that asks about your proficiency with various skills. There are many skills on this list due to the diversity of projects within Akamai; it is common for an applicant to just have experience with a few of these skills. Applicants should not feel discouraged when they just check a few – we know you want to gain skills and that’s why you’re applying to an internship program! Who should I get my references from? Applicants should get reference letters from people who can directly comment on the candidate’s performance and capabilities in a technical/scientific environment. Two examples of people that might be good references: 1) college faculty member/instructor of an applicant’s recent science, engineering or technology course; 2) an engineer/STEM manager from industry who has mentored/supervised the applicant during a job, capstone project or another internship. Applicants are strongly encouraged to get reference letters from college instructors, rather than high school teachers. Reference letters from people who are not able to comment directly on the applicant’s performance and abilities (people who have not had the student in a course or directly supervised their technical work) can be accepted but will make the application less competitive. Do I need to get certified transcripts? No. Unofficial transcripts are all that is needed, and can usually be obtained online for free at your college or university. Do I need to include all transcripts? Yes. Transcripts from all institutions you have attended should be submitted with your application. This includes any institution that you enrolled in, regardless of whether you earned a degree or not. How should I submit my transcripts? The preferred method of submission is to upload your transcripts as a PDF within the application, though please note there may be a size limit on large files. If there are difficulties with online submissions, please contact us. How formal should I be in responding to questions on the application? Applicants should write in complete sentences with correct spelling and punctuation, and avoid using the casual style made popular with phones and social media (e.g. all lower case, no punctuation, abbreviations, etc.). The selection committee wants to get to know the applicant, so it is important to be honest and show who you are, especially in relation to what has shaped your education and career goals and interests. For example, what you’ve learned from any past challenges, scientific or technical areas you’re really interested in or passionate about, or experiences you’ve had that have shaped your interests. The committee is also looking for an indication that you will be a team player, and how you will use the internship experience to further your education and career goals. What is the “Akamai PREP Course”? The Akamai PREP Course is a 4-day intensive that has always been part of the internship program and is an important part of the overall experience in Akamai. 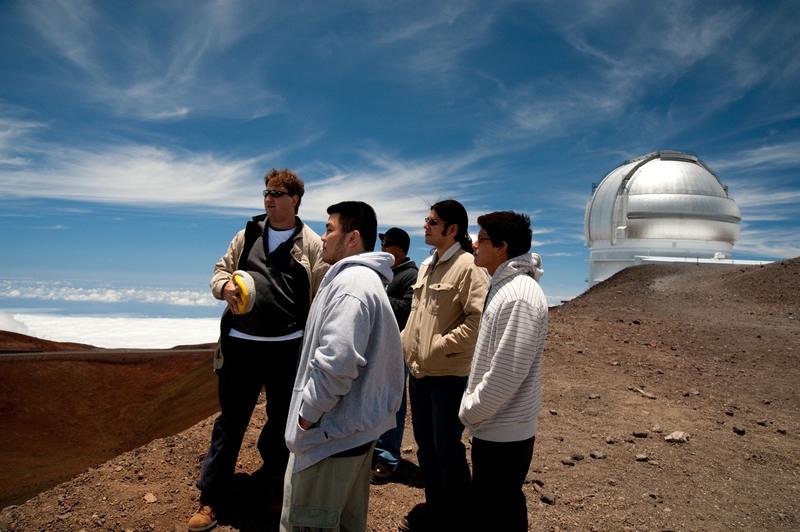 The course takes place in Hilo, Hawai‘i Island or Kahului, Maui and all interns are required to stay in double occupancy with the entire intern cohort. During the course, interns work in teams to solve problems, and get a lot of practice working on ill-defined problems (like they’ll likely tackle during their internship) and justifying their solutions. The course is taught by a team that has been trained to teach engaging, effective laboratory-like activities and is very hands-on. Interns get a chance to make friends with other interns, instructors, and program staff, so that they have a strong support network that lasts throughout the summer and beyond. The PREP Course is hard work and a lot of fun! I live in the location of the PREP course, can I just stay at home during the PREP Course? During the preparatory course, Akamai has reserved everyone housing to encourage all able interns to stay together, with the main objective to guarantee your ability to participate in the long, full days of PREP and also to build community with your fellow interns. While staying there is not required and you are able to return home after all Akamai events have concluded for the day, we really hope you are able to participate in social gatherings with the other interns during PREP week and make sure that you arrive on time every morning for the start of the PREP course. How does Akamai decide where to place interns for their project? The selection committee considers how best applicant qualifications align to the minimum skill set needed to complete a project, as well as the skills likely to be gained by the intern and whether these skills will support applicants’ education and career goals. Applicants are also asked about their preferences for locations and interests in past intern projects, as well as locations at which they do not want to be placed. The selection committee considers these preferences and takes great care to match applicants with a mentor and site that will provide a productive project experience – that is, a project that will be a valuable contribution to the internship host site and will be a challenging project for the intern. There are also housing, transportation, and other factors that are considered in the placement process. If I get accepted, when do I know where I am placed? Akamai sends out acceptances in early March. An acceptance is an offer to the applicant to join the program, which includes the placement offered to the applicant (site and type of project). Applicants then have a few weeks to formally accept or reject Akamai’s offer. We provide housing for all interns who need it in order to work at their internship site. For example, if you live on Maui and your internship site is in Hilo (on the Big Island), we will provide you with housing in Hilo. We also provide housing if you will have a long driving commute to get to your internship site. The housing that we provide is generally double occupancy, so most likely you will share a room with another intern. All accommodations include kitchens, so you will be able to make your own meals. Interns are expected to cover the costs of their own meals during their internship (except during the PREP course, as noted below). During the PREP course, all interns stay together (first 4 days of the internship program), and we cover the cost of rooms and meals. In most cases, interns are provided housing that is within walking distance of their internship site. However, there are some exceptions where housing is not available near an internship site (e.g. NELHA in Kona). In some situations we are able to provide a stipend to cover transportation costs when walking to the internship site is not possible, and this is arranged on a case-by-case basis. The application includes a place for applicants to indicate any sites where transportation would be needed. Interns are provided transportation during the PREP course, including a ride from the airport to the provided housing. Applicants should not let a lack of transportation get in the way of applying; we are almost always able to figure out a way to manage it.